The Healthy Lunch Combo Pack includes a salad container, sandwich container, water bottle and insulated tote - everything that you need to pack a variety of delicious foods for lunch. The Salad POD hlds up to 2 1/2 cups of lettuce and 2 tbsp of dressing. A removable ice pack clips into the lid to keep food fresh, while the unique dressing dispenser keeps your dressing separate from the salad. If you don't want salad, then use this container to hold fruit or leftovers and the dressing dispenser for dip or condiments. The Lunch POD is a convenient way to take a healthy sandwich, entree or sanck with you. The removable ice pack in the lid will help keep everything fresh and chilled. Stay hydrated with the 26 oz water bottle that is included with this pack. The Insulated Chiller Bag works to keep everthing cool until mealtime. 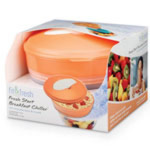 All Fit & Fresh products are BPA (bisphenol A) free, easy to clean, freezer, microwave and top rack dishwasher safe (except for the ice packs). Do not microwave the ice packs. 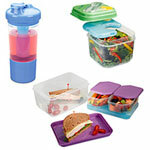 All these products meet FDA regulations for food grade plastic and liquid contents are non-toxic.